WB No. 244: LOON is a 24′ efficient trailerable cruiser for two, with room for an occasional overnight guest, or several more for day trips. 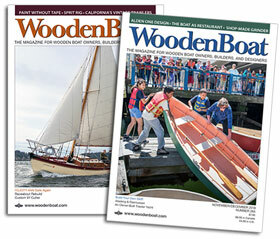 The lightweight wood-epoxy construction and narrow 6′5″ beam permit excellent performance from a 40-hp, four-stroke outboard motor. Expect 11 knots at cruise, requiring only 22 hp of power, and a top speed of over 15 knots (for dodging those river barges). The nimble handling and 11″ shallow draft (with motor up) will encourage exploration of even the tiniest creeks and shallowest bays along the route. The flat bottom safely takes to the ground, and makes overnight beaching a viable option. Though we have not studied the route in detail, LOON’s easy trailerability might come in handy as a way to “portage” around some busy canal locks, if desired. 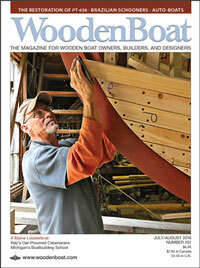 See more in Designs: Sketchbook, WoodenBoat issue 244.